The 70s were significant for Vale, in that it saw them truly come into the modern era. Although the club had recruited some players from the Galashiels area, results were not as had been hoped with Vale exiting the Scottish Qualifying Cup at the hands of Hawick Royal Albert and winning only eight out of their 32 league games and finishing fourth from bottom. The following season saw a slight improvement, taking Tarff Rovers to a replay in the Scottish Qualifying Cup with a 2-2 draw in Innerleithen before a 2-1 defeat at Kirkcowan, reaching the Third Round of the King Cup and a mid-table finish in the East of Scotland League. At this point Vale were run, in common with many other sides, on a fairly informal basis. Training sessions were overseen by a trainer and the team on a Saturday was picked by the committee, some of which pulled on the boots themselves when there was a shortage of players. The standard of the East of Scotland League was getting harder due to several Scottish League teams entering reserve or ‘Colt’ sides into the league, with Arbroath, Cowdenbeath, Hearts, Hibs, Queen of the South and Raith Rovers all represented at some point during the decade. While these teams contained mainly young players, league games could be used to get injured first team players back to match fitness. The way Vale operated was becoming out of step with the times and many small clubs were going down the route of appointing a team manager to look after the playing side, while the committee concentrated on the administration side of things. Back Row: Whiteford (Trainer), Thomson, McMenemy, Pajak, Kirk, Maloney, McLeod. Front Row: Brown, Stanage, Gray, Harris, Forrest. An unpromising start to the 1972-73 season followed, but when Vale travelled to Edinburgh to face Civil Service Strollers in the Second Round of the Scottish Qualifying Cup, the result was a 2-2 draw and Vale won the replay 4-1. In the Third Round a home tie with Edinburgh University ended 0-0, but Vale again triumphed 4-1 in the replay. The Semi Final brought Ferrranti Thistle to Victoria Park. Ferranti, who within a couple of years would join the Scottish League, change their name to Meadowbank Thistle and much later become Livingston FC, were strongly fancied to win the game, but Vale won in fine style 5-0. Duns were the opponents in the final and in the first leg at Innerleithen, goals from Brown, Stanage and Harris gave Vale a 3-0 lead. A goal from Forrest in a hotly contested second leg in Berwickshire gave Vale a 1-0 victory and the Scottish Qualifying Cup (South) Trophy. The team that did it for Vale was; J McMenemy, J Riddell, I Roberts, R Thomson, F Pajak, J Gray, N Brown, B Stanage, B Harris, P J Maloney and A Forrest. Substitutes were J Gillie and M McLeod. The joy of winning the trophy was tempered the following Saturday in a league game against Eyemouth United when captain and Scotland Amateur cap Jim Gray sustained a broken leg – an injury which unfortunately ended a career which had looked so promising. The Scottish Cup saw Montrose the visitors to Victoria Park, and although half time saw Vale holding their Scottish League opponents at 0-0, Montrose finished up winning 3-0 in front of a crowd of 300. Season 1973-74 was a dismal one, with Vale dumped out of the Scottish Qualifying Cup by Civil Service Strollers and going on to finish second bottom of the league after only winning five games. As usual there were hopes that things would improve, but season 1974-75 could possibly lay claim to being the worst Vale have endured in their entire history, on and off the park. The league record was terrible, with only four games won out of 23. Vale did reach the semi-final of the Qualifying Cup, but were beaten 2-0 by Selkirk. On the plus side, the ‘200 Club’ was set up to boost finance, but support for the club was dwindling rapidly with attendances down and vandalism becoming an increasing problem at Victoria Park. This came to a head in the early hours of the morning of 3rd August 1974, when the pavilion at the east end of the ground was completely destroyed by fire. Everything in the pavilion was lost, including football gear and goalnets, but while these things could be replaced, the biggest loss was the club records and minute books which formed a historical record of the club, and was now gone forever. The cause of the fire was never properly determined, but it was commonly thought to have been started deliberately by youngsters. Pipe Major Robert Euman of the British Legion Pipe Band offered Vale the use of their band hut in the public park for dressing rooms until a new pavilion could be built, an offer which was gladly accepted, despite the hut having no hot water supply. In the Scottish Cup Vale were handed another home tie against Montrose, but with Victoria Park having no facilities the tie had to be switched to Links Park and the game saw Vale suffer a 0-12 humiliation – their heaviest ever defeat to this day. 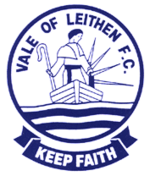 Season 1975-76 however, saw the dawn of a new era for Vale of Leithen when the club appointed Finlay Watson as it’s first ever team manager. Watson, a former player, had contacted the club secretary Eddie Sanderson expressing his dismay at how results were going. Mr Sanderson retorted that if he thought he could do any better, he was welcome to try. “I might just take you up on that,” came the reply. Watson brought an almost immediate improvement, recruiting many players from the Midothian area and the final of the King Cup was reached with Vale going down 5-4 against Selkirk after a great game. Season 1976-77 saw Vale runners-up in the East of Scotland League and capturing the Scottish Qualifying Cup (South) for the third time. After a bye in the First Round, Vale beat Newtown Stewart 5-1 away and in the next round Dalbeattie Star 4-1 at home. The Dalbeattie game was a proud day for the club as they officially opened the new Victoria Park pavilion. The semi-final saw a visit to Selkirk, who a month earlier had beaten Vale 5-1 in the East of Scotland Qualifying Cup. A hotly contested game was tied at 1-1 with time running out, when Billy Crookston cut a ball back from the bye-line into the path of John Burns, who hit a cracking shot into the top corner – a goal fit to win any game. The opponents in the final were Girvan Amateurs, and although the first leg at Girvan ended 2-0 to the hosts, the return at Victoria Park saw Vale winning 4-1, to triumph 4-3 on aggregate. The successful team was; Hodge, Crawford, Sivewright, O’Donnell, Miller, Johnston, Pringle, McGovern, Williamson, Hall and Burns. Substitutes were Crookston and Wright. The Scottish Cup saw Vale drawn away to Elgin City, then a Highland League side. After being postponed on the original date, the game went ahead on Tuesday 18th December. The game was played out on a snowy pitch, with conditions deteriorating into a blizzard in the second half and the home side ran out 4-0 winners. Despite the conditions, there had been an attendance of 853, giving Vale a handsome £136 as their share of the gate, some consolation as the bus only arrived back in Innerleithen at 6.30am the following morning, which was none too handy for those with work to go to that day! October 13th 1976 proved to be an unforgettable day in the club’s history when an East of Scotland League game against Eyemouth United ended 16-0 to Vale – the biggest win in their history. Scorers that day were John Burns 5, Billy Crookston 3, Ian Haggarty 3, P McGovern 3, Billy Miller and Jim Sivewright. In season 1977-78 Vale reached the semi-final of the Scottish Qualifying Cup, losing 4-3 at home to Selkirk, but had once again qualified for the Scottish Cup. The draw saw Forfar Athletic visiting Victoria Park on the 7th January 1978. Played in front of 746 spectators, the game was fast and furious but goalless at half-time. Early in the second half, a through ball saw Vale outside-right Bernie Callaghan speed through the Forfar defence to shoot home the opening goal. Alan Notman added a second and substitute Harry Reid bagged a third. Forfar were stung into action and some intense pressure led to them pulling one back, but another Vale goal, again from Reid, and it was game over for what is possibly the finest result of Vale’s history. The result can be put into context with the fact that just a few weeks later Forfar played Rangers in the Semi Final of the league cup at Hampden and were leading 2-1 with 8 minutes remaining, before Rangers equalised and went on to win in extra time. The Third Round saw Queen’s Park visit on the 4th of February. Snow had to be cleared from the pitch before the game could take place in front of a crowd of 1185. Sadly there was no giant-killing act this time, with Queen’s Park winning by a solitary goal, but it was a fine performance by Vale, with even the Queen’s coach admitting afterwards that they had stolen the game. Fine performances weren’t just restricted to the cup though and by the end of the season, Vale had won the East of Scotland League for the first time, with a record of Played 26, Won 18, Drawn 5, Lost 3, scoring 70 goals and conceding 27. Season 1978-79 saw Vale retain the league title as they were declared champions ahead of Selkirk and they also won the East of Scotland Qualifying Cup, beating Civil Service Strollers 2-1 at a final played at Tynecastle Park, Edinburgh. Vale also reached the final of the Scottish Qualifying Cup but lost 3-2 on aggregate to Gala Fairydean. In a strange twist, the Scottish Cup draw saw Forfar Athletic visiting Victoria Park again. It was another fine game, with the final score again 4-1, but this time in favour of Forfar. In October 1978 a benefit game was played for goalkeeper Robert Hodge, from Loanhead, whose career had been unfortunately ended by a very bad arm injury sustained in a league game against Eyemouth United. Celtic provided the opposition and their team contained the future Republic of Ireland goalkeeper Pat Bonner. The game ended 2-1 to Vale and a healthy crowd of 1,500 ensured a tidy sum went to the injured keeper. By the end of the decade the Scottish League sides had mostly withdrawn their reserve sides from the East of Scotland League, with only Berwick Rangers still remaining. Edinburgh side Spartans, who had been very much also-rans in the league prior to the 70s, were starting to make a big impression and could be considered as the capital’s ‘fourth side’ at the time. Also from Edinburgh, newly formed Craigroyston had joined the league. The decade mainly belonged to the Borders sides though, with eight of the championships shared between Eyemouth United, Hawick Royal Albert, Selkirk and Vale, while Vale were able to resume their rivalry with near-neighbours Peebles Rovers by the end of the decade, when they returned to the East of Scotland fold. But the most significant addition to the league came in the shape of Whitehill Welfare, a club from the Midlothian village of Rosewell, who won the 1979-80 championship in their debut campaign. It was the first of four league titles they would claim in their first four seasons and they would go on to dominate East of Scotland football like no other club before them.